"The Jack of Hearts card knows how to go above and beyond the call of duty in regards to love even when it is difficult or even costly to them. For this reason, the Jack of Hearts is called the 'Christ' card. Being in the Circle of Seven (see section below) brings deeply challenging and rewarding bonds with others in the circle, and the potential for profound growth in this lifetime. Often Jack of Hearts experience losses early in their life. 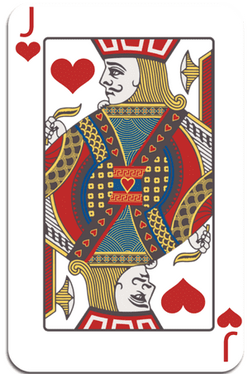 The Jack of Hearts is one of three 'Fixed Cards' with whom they share profound connections (see the Circle of Seven section below), and a fixed or stubborn nature. Their tendency to be rigid in certain aspects is a necessary balance to their other attributes which include care-taking, generosity, and shape-shifting to please others. All Jacks are impulsive, immature, self-doubting, and even manipulative at times, but this Jack is less so, because it is a Heart, and therefore more in touch with the emotional dissonance the Jack qualities can create in relationships. Jack of Hearts are also lighthearted, funny, and creative. They have a gift with words and have a deep need to create. When they do, they can introduce us to a new way of being. They are natural cheerleaders and love to nurture others and help them achieve their potential. They constantly see what is possible, despite..."
​Sagittarius, you have a Planetary Ruling Card that IS one of your Royal Archetype Cards, (King of Hearts). That report is included in the Kit below.